You might wonder why I’m posting payment proof again after my very recent post here. The first post came from winning in a prediction survey on PaidViewpoint. That was pretty cool, but this one comes from completing the surveys up to the required $15 minimum. 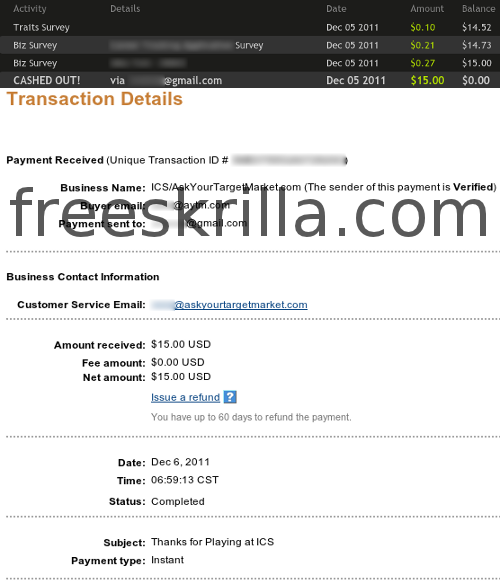 The top of the image shows the earnings up to $15 and my cashout, and the bottom is from PayPal. Remember that ICS (Instant Cash Sweepstakes) is run by the same company as PaidViewpoint (though the two sites are similar, and yet very different), and that is why the subject says ICS. They say you’ll receive payment within 72 hours. I requested payment last night and had the PayPal payment today. You can click here to see PaidViewpoint for yourself (and sign up if you like what you see), where you will get paid for filling out surveys. You can read some other posts I’ve made about it by clicking here too.